I wrote this the other day about my last grandparent dying. I keep picturing a Tetris game, where you complete a row and it ker-thunks down and that row falls off into a digital void. The loss of the last of my grandparents feels like that row ker-thunking away. There is no bringing it back, and the game keeps pushing on. If you stop, everything piles up into a chaotic, frantic mess. But the loss of that row is a little scary. It implies that the next row, my parents, are next. Then I’m up. And the game pushes inexorably on. I was talking with my mom this morning about how lucky I was to have had all of my grandparents not only alive and well up through my adult-hood, but to have been so close with them. When my maternal grandmother died (age 96) in 2008, I remember my mom saying that the torch had been passed to the next generation. My grandfather had died in 2001 (age 92) so when grandma died, my mom and her brother, my uncle, became the heads of our small family. My paternal grandfather died in 1998. He was the only one of the four to have had a difficult death. He had worked in (auto) garages his whole life, except for his military service. He had a difficult death caused by a lifetime of smoking. Emphysema is not one of the easier ways to go. He had permanent grease under his fingernails, which as a child fascinated me. To me it meant that he was a hard worker and had something to show for it. I think I was fascinated by both grandfather’s hands – my memorial speech for my maternal grandfather was about his large, worn, worked hands. My grandparents were blue-collar working people, with the rough, scarred hands to show for the toils. My grandma who died this morning was an amazing woman. Like the rest of my family, hard working and tough. She had an indomitable spirit, that I often try to channel when I’m having a difficult time. She was the last of my grandparents to die. She was 95 years old, and even while in hospice, her same stalwart spirit was there. Her matzoh-ball soup was legendary in our family, and we were all saddened when she was no longer able to make it. In a Jewish family, food is one thing that we congregate around. It is how we communicate. I grew up with grandma’s egg creams, matzoh brei, (often with cottage cheese mixed in), melty butterscotch brownies, a never-ending confusion from grandma as to why I didn’t like gefilte fish, and of course, her delectable matzoh ball soup. I’ll never have grandma’s matzoh ball soup again, but my Aunt will carry on the traditions of our family and we will now congregate around her hand-hewn oak dining table. 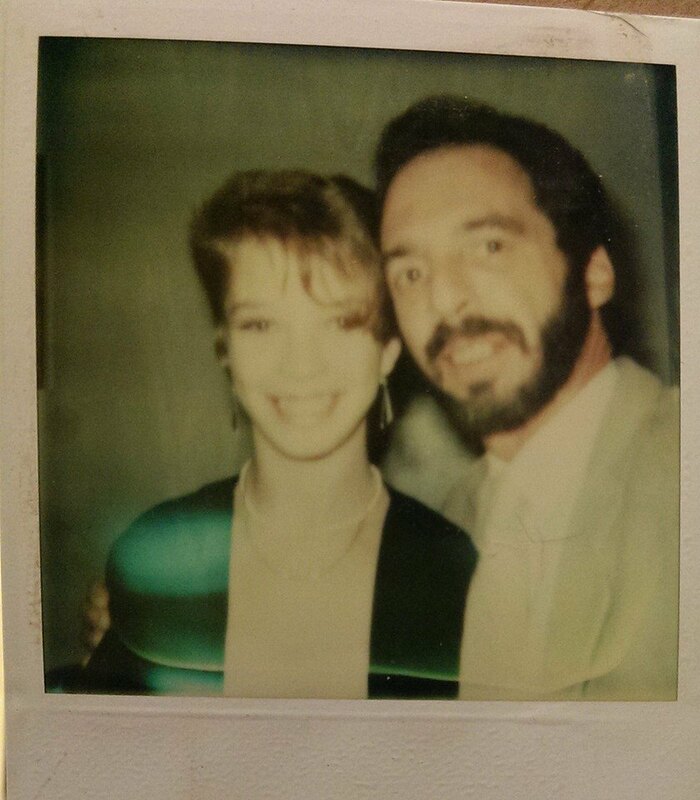 One of the weird things I noticed the other day about missing my dad is that my life is pretty good. I have this dog. She’s a pug. Never thought I’d ever like a little dog, but this snorting, snarfling, pudgy, little creature had wiggles and sneezed her way into my heart. I want to send my dad her funny pictures and laugh with him at her odd amusing ways. When I took pictures of her at my friends St. Patrick’s day party, I thought about how hard he would have laughed at her picture with the Buddha statue. 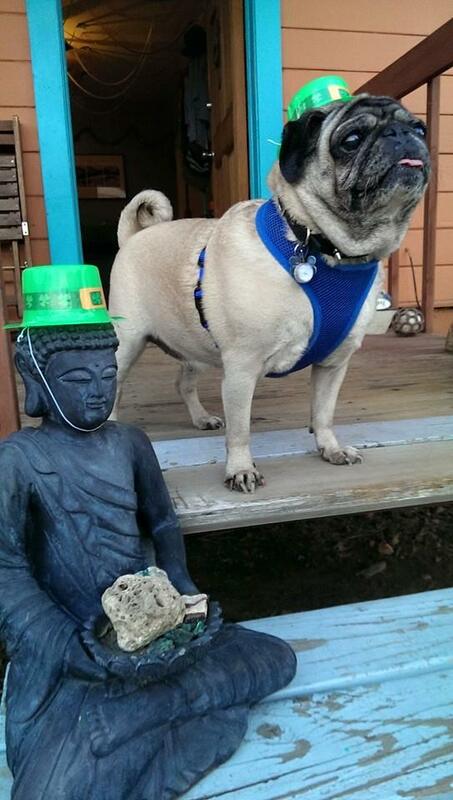 We would have joked about the Zen of Pugs. After a number of years of working towards a career goal, I have a job that I love. When I wake up in the morning, I actually look forward to going to work. I consider myself lucky. Earlier today, I was making up stories of what I’d tell my younger self. I wanted to tell her to listen to your dad. He had some things that made a lot of sense – now listen to them! He would be so proud of me, and so terribly happy to know that I am so enjoying my life. When I got my first cell phone, my dad and I talked every day. It was New Technology and it enabled us to be connected like we never could before. It was so cool! When the iPhone first came out, all I could think about was how excited he would have been playing with one. Where I work, we have dictation computers for the doctors. When I first encountered these a few years ago, I remembered my dad struggling with early voice-to-text software. He knew it had promise, but it wasn’t at a usable point then. It’s an odd feeling missing someone and being terribly sad that they are gone, while at the same time feeling satisfied and happy with a wonderful life that you want to tell them all about.